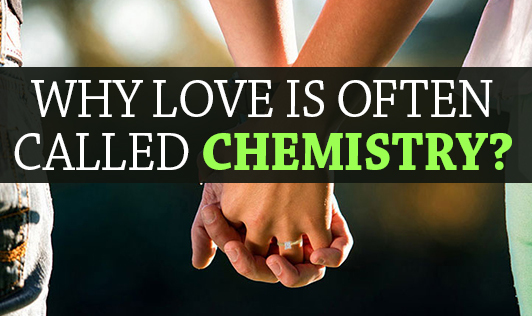 Why Love Is Often called Chemistry? Love is an emotion of strong affection and personal attachment. In philosophical context, love is a virtue representing all of human kindness, compassion, and affection. Love may also be described as actions towards others (or oneself) based on compassion, or as actions towards others based on affection. Lust is the initial passionate sexual desire that promotes mating, and involves the increased release of chemicals such as testosterone and estrogen. These effects rarely last more than a few weeks or months. MRIs show that two parts of your brain light up like a movie marquee when you are in the romantic phase of love. Why? Because of the love potion ingredient called dopamine (it's the addictive substance that sugar, sleep, thirst, and tobacco also release). When you are in love, your brain pumps out dopamine and increase the release of serotonin, the euphoria hormone. So the better you feel, the more you want. You also get a surge of the hormone oxytocin, which promotes a feeling of togetherness. Recent studies in neuroscience have indicated that as people fall in love, the brain consistently releases a certain set of chemicals, including pheromones, dopamine, norepinephrine and serotonin. This acts in a manner similar to amphetamines, stimulating the brain's pleasure center and leading to side effects such as increased heart rate, loss of appetite and sleep, and an intense feeling of excitement. Research has also indicated that this stage generally lasts from one and a half to three years. Attachment between adults is presumed to work on the same principles that lead an infant to become attached to its mother. The traditional psychological view sees love as being a combination of companionate love and passionate love. Passionate love is intense longing and is often accompanied by physiological arousal (shortness of breath, rapid heart rate); companionate love is affection and a feeling of intimacy not accompanied by physiological arousal. Then when is the trouble? You develop a tolerance to dopamine over time, and the chemical tide that drives humans to stick together starts to recede as well. Relationships can lose some of their luster, which is why they need to move from being purely romantic to a deeper level of beauty, creating a fertile field for lifelong pair bonding. Chemistry is never a mystery, but love is!